浏览器拥有一系列成熟的缓存策略. 按照发生的时间顺序分别为存储策略, 过期策略, 协商策略, 其中存储策略在收到响应后应用, 过期策略, 协商策略在发送请求前应用. 流程图如下所示. 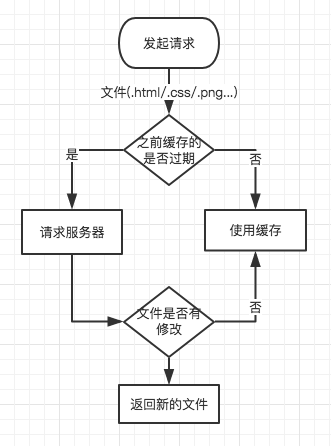 如果Expires, Cache-Control: max-age, 或 Cache-Control:s-maxage 都没有在响应头中出现, 并且也没有其它缓存的设置, 那么浏览器默认会采用一个启发式的算法, 通常会取响应头的Date_value - Last-Modified_value值的10%作为缓存时间. 实体标签，（参见14.19）, 服务器资源的唯一标识符, 浏览器可以根据ETag值缓存数据, 节省带宽. 如果资源已经改变, etag可以帮助防止同步更新资源的相互覆盖. ETag 优先级比 Last-Modified 高.
ExpiresByType text/css "access plus 30 minutes"
ExpiresByType text/txt "access plus 30 minutes"
ExpiresByType text/js "access plus 30 minutes"
ExpiresByType application/x-shockwave-flash "access plus 30 minutes"
It looks to me that it makes some caches out there to cache theresponse from the origin server more reliable as in rfc2616(ftp://ftp.rfc-editor.org/in-notes/rfc2616.txt) is written.